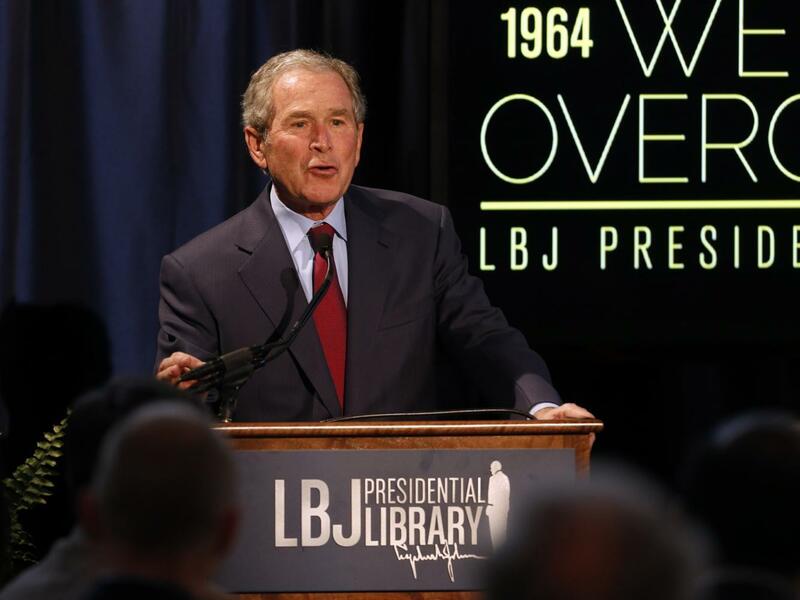 Defying all expectations of his speaking ability, former President George W. Bush gave an eloquent speech last week criticizing the Trump administration. “We’ve seen nationalism distorted into nativism — forgotten the dynamism that immigration has always brought to America,” he said. The former president gave this speech at the Spirit of Liberty event in New York City on Oct. 19. This event, hosted by the George W. Bush Institute, sought to “affirm American values of freedom and free markets,” and featured speakers including Laura Bush and former Secretaries of State Madeleine Albright and Condoleezza Rice. Bush spent his 16-minute speech condemning the rise of populism within both the Republican and Democratic parties. He remarked on the downfalls of isolationism, on the negative impacts of xenophobia and on the importance of freedom — after all, it was a Spirit of Liberty event. A sample of comments on a New York Times video of the speech reveals widespread praise for Bush. “Couldn’t stand Bush when he was in office, but I would gladly put him back in the [White House] over what we have now; at least he is an adult and has a conscience,” writes one reader. “I would’ve never thought I’d say this, but I’d much rather have Bush in office right now than Trump,” writes another, garnering over 800 likes. These former Bush critics lauded Bush for the speech, and even said they’d rather have him in the Oval Office than President Donald Trump. To them, words speak louder than actions — this one speech erased all of his past mistakes. But this mindset just holds our country back. We cannot forget his missteps — we must keep holding our presidents, both former and present, accountable. In case you’ve forgotten, here’s a brief recap of the lowlights of the Bush presidency. He won the presidential election in 2000 against former Vice President Al Gore by 537 votes in Florida, a state in which Gore lost 6,607 votes because of the “butterfly ballot,” a format of ballots where the boxes are in the middle, causing confusion as to which candidate they correspond. And by the end of his first term he preemptively launched the Iraq War because our nation’s intelligence agencies had “no doubt” Iraq possessed weapons of mass destruction — a 2008 Senate report found no evidence of any development of chemical, biological or nuclear weapons. In his second term, his administration failed to properly respond to Hurricane Katrina, a storm that resulted in the deaths of more than 1,000 people in New Orleans and more than $100 billion in damages. Trump’s first nine months haven’t been any better. During his campaign, he called “for a total and complete shutdown of Muslims entering the United States until our country’s representatives can figure out what is going on.” The original statement has since been removed from his campaign site, but he followed through on his promise with multiple bans on travel from Muslim-majority regions. His administration also repeatedly attempted — and failed — to repeal former President Barack Obama’s health care bill. Some of the repeal bills would take health care away from 29.8 million people. None of these actions deserve any praise. But when most people discuss these two presidencies, they don’t quote statistics — they quote the presidents themselves. And they don’t quote them at their best — they quote them at their worst. Bush was arguably the least eloquent president at the time of his tenure — though he’s losing that title by the day. Among his most memorable are the following gold nuggets. “Rarely is the question asked: Is our children learning?” he questioned in Florence, South Carolina. “Yesterday, you made note of my — the lack of my talent when it came to dancing. But nevertheless, I want you to know I danced with joy. And no question Liberia has gone through very difficult times,” he remarked to the president of Liberia. Though embarrassing, these remarks are at least palatable to the average American. We can laugh at him and remember his speaking blunders, but this sometimes ignores his tarnished legacy. He can still give speeches, like the one at the Spirit of Liberty event, and receive praise if he conveys a powerful, clear message. Meanwhile, Trump has made vulgar remarks that actively discriminate and insult. “They’re bringing drugs. They’re bring crime. They’re rapists. And some, I assume, are good people,” he said in his opening campaign speech about Mexican immigrants. “He’s not a war hero. He was a war hero because he was captured. I like people who weren’t captured,” he said in 2015 about Sen. John McCain. We cannot forget the eight years of atrocity we faced under Bush, not even after one good speech. Bushisms were results of absurdity or poor grammar, while Trumpisms are often vulgar and directly offensive — perhaps that’s part of the reason that Bush’s approval rating rests comfortably at 59 percent, up from 34 percent in 2009 at the end of his presidency. But in the end, the public’s response to Bush’s speech shows the blindness hindsight affords. Instead of heralding Bush for one public speech, let’s use this as an opportunity to remember that we should hold our presidents accountable for their actions, not just their words.